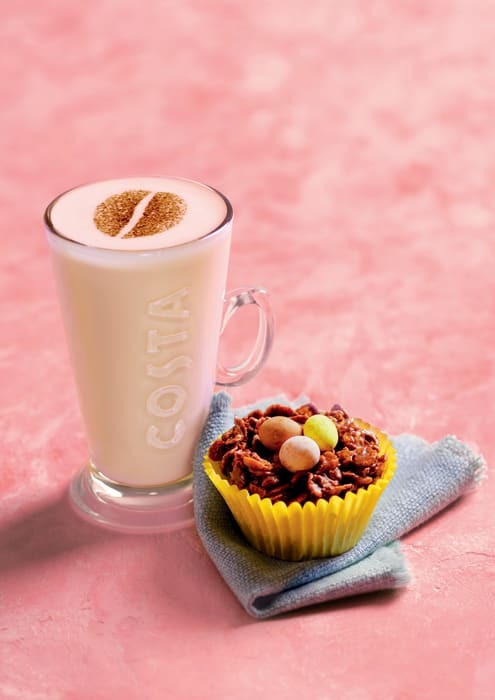 The Nation’s Favourite Coffee Shop, Costa Coffee is putting a spring in its step with the launch of the new March menu to complement its range of signature handcrafted coffees. Available in stores nationwide from Thursday 7 March, the refreshed menu comes complete with brand new savoury and sensational sweet options to tickle everyone’s taste buds. With Easter just around the corner the menu features favourites including the new chocolatey-filled Cornflake Nest which is topped with mini Easter eggs. The sweet menu includes the light and crispy Costa Coffee Snackwafers, available in two cream filled flavours; cocoaand vanilla. The popular Choc-O-Crunch is making a seasonal come back – a ring of crispy rice bound in caramel flavouring and covered in three pastel shades of white chocolate. Following the launch of an expanded range of milk options including Almond Drink and Lactofree Milk earlier this year, Costa Coffee has continued to ensure there is something for everyone with an increased range of gluten free and vegan menu items. The menu includes a Gluten-Free Raspberry & Coconut Bar – a gluten free pastry with a raspberry and sultana filling, and a coconut topping as well as the new Dairy Free Gluten-Free Vegan Fruity Flapjack filled with gluten free oats, sultanas, cranberries and apricots. For those looking for a savoury hit, the fabulous Cheese Scone and Cheese Twist are back on the menu! Served warm, the Cheese Scone isenclosed withmature Irish cheddar, parmesan style cheese, chives and a spice hit of cayenne pepper to give a luxuriously indulgent eat. The classic Cheese Twist sees a buttery puff pastry complete with mature cheddar and parmesan style cheese to give the ultimate cheesy snack.